Democrats on the HELP committee join a growing chorus of congressional criticism of the “gag rule,” which is set to go into effect on May 3. 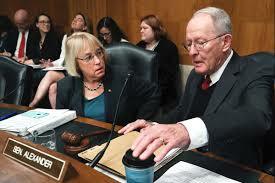 Sen. Patty Murray (D-WA), the committee’s ranking member, voiced support for a hearing. A group of Senate Democrats sent a letter on Monday to committee leadership demanding a hearing on the Trump administration’s newly finalized rule restricting family planning funding, dubbed the domestic “gag rule” by opponents. Democrats on the U.S. Senate Committee on Health, Education, Labor, and Pensions (HELP) explained their concern that the anti-choice restriction would force providers to violate medical ethics by banning referrals for abortion care. The letter also says that the rule’s requirement that clinics physically and financially separate Title X-funded family planning services from abortion services “appears to be aimed at and would disproportionately affect Planned Parenthood health centers, which currently serve over 40% of Title X network patients.” The letter says this could present a burden to other providers if Planned Parenthood, the country’s largest provider of Title X services, is cut from the program. The letter was addressed to Committee Chair Lamar Alexander (R-TN) and Sen. Patty Murray (D-WA), the committee’s ranking member. It was signed by Sens. Elizabeth Warren (D-MA), Doug Jones (D-AL), Sen. Bernie Sanders (I-VT), and the seven other non-ranking Democrats on the HELP committee. Alexander did not respond to a request for comment from Rewire.News by the time of publication. Democrats on the HELP committee join a growing chorus of congressional criticism of the gag rule, which is set to go into effect on May 3. Democrats on the U.S. House Energy and Commerce Committee sent a letter to U.S. Health and Human Services Secretary Alex Azar earlier this month questioning the rule’s legality. Lawsuits seeking to prevent the rule’s implementation are starting to pile up. The American Civil Liberties Union filed a lawsuit in early March on behalf of the National Family Planning & Reproductive Health Association (NFPRHA) and Cedar River Clinics, a family planning provider based in Washington state. The Center for Reproductive Rights filed its own lawsuit on behalf of Maine Family Planning, the state’s sole recipient of the Title X family planning funds targeted by the administration. Attorneys general from 21 states are also filing suit against the rule.